THE Town Hall has cut links with organisers of the East End’s biggest culture festival after allegations connected to work permits. 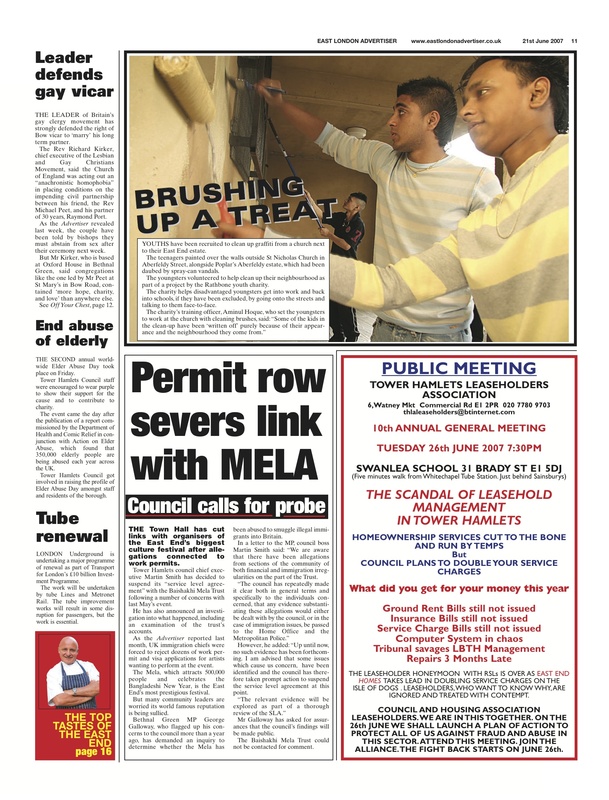 Tower Hamlets council chief executive Martin Smith has decided to suspend its “service level agreement” with the Baishakhi Mela Trust following a number of concerns with last May’s event. He has also announced an investigation into what happened, including an examination of the trust’s accounts. As the Advertiser reported last month, UK immigration chiefs were forced to reject dozens of work permit and visa applications for artists wanting to perform at the event. The Mela, which attracts 500,000 people and celebrates the Bangladeshi New Year, is the East End’s most prestigious festival. But many community leaders are worried its world famous reputation is being sullied. Bethnal Green MP George Galloway, who flagged up his concerns to the council more than a year ago, has demanded an inquiry to determine whether the Mela has been abused to smuggle illegal immigrants into Britain. In a letter to the MP, council boss Martin Smith said: “We are aware that there have been allegations from sections of the community of both financial and immigration irregularities on the part of the Trust. However, he added:“Up until now, no such evidence has been forthcoming. I am advised that some issues which cause us concern, have been identified and the council has therefore taken prompt action to suspend the service level agreement at this point. Mr Galloway has asked for assurances that the council’s findings will be made public. The Baishakhi Mela Trust could not be contacted for comment. Dhaka, May 27 (bdnews24.com) –Police have arrested 19 Bangladeshi applicants for UK visa at the British High Commission in Dhaka on charges of fraud. The applicants were arrested on May 24 as they had provided forged documentation and false statements with their business visitor visa applications to attend the London Boisakhi Mela, as stall holders, the High Commission said in a media statement. The Bangladeshi law-enforcers worked in close cooperation with the UK Border Agency and discovered that the applicants had misrepresented their employment status and produced forged bank statements. The group admitted that they had paid agents up to Tk 1 million (approximately £10,000) each to facilitate their visa applications and provide forged documents. Terming the agents criminals, he strongly advised visa applicants not to listen to agents who offer to sell forged documents and say they can guarantee a visa. Following Lutfur Rahman’s election to Tower Hamlets Mayor, it was widely predicted here and elsewhere that his self-styled main financial backer, millionaire housing association tenant Mr Haque, would soon be given back control of the annual Mela. And last July, as I reported here, it came to pass. Now, there is no suggestion that he has any links to these arrests in Dhaka, but I would imagine that investigations are underway to find out just who was demanding the £10,000 fees for “visa facilitation”. So I wonder whether whoever is the chief executive of rudderless Tower Hamlets Council at the moment will take the same strong decision as Martin Smith five years ago and suspend relations with the Boishakhi Mela Community Trust pending these investigations? I doubt it. We remember what happened to Martin a year later, don’t we… . So much of what that man touches becomes sullied. Why does he seem to have so much influence? UPDATE – 6.45pm, Sunday, May 27. The British High Commission in Dhaka has a statement on its website here. As I say in a comment below, it’s my understanding that anyone applying for a business visa to the UK needs a British based business sponsor. These come in the form of a letter from the UK business which would attest to the true nature of teh work to be done. I’d imagine that the Boishakhi Community Mela Trust probably provided such letters to artistes from Bangladesh. I’ve no idea whether it did so in the case of the arrested 19 wannabe “skilled worker” stall-holders.